This will run from Sunday 23th October to Saturday 29th October 2016. This theme focuses on the qualities of the paddler on a canoe, the size of the swirls is an indication of the effort made by the paddler in order for the canoe to move forward. Tokelau consists of three tropical coral atolls situated the South Pacific. Tokelauan Language is the official language of Tokelau. 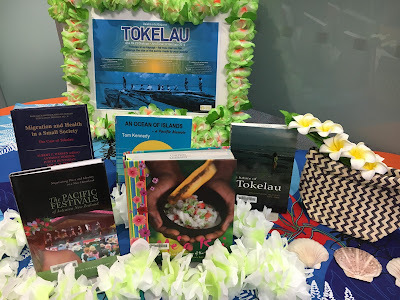 Unitec Library has resources both in print and electronic to help you learn and become familiar in Tokelauan language. Check out the Unitec Library catalogue and our Pacific subject guide. Come in and see our displays! Use the hashtag ##TokelauLanguageWeek to follow the events on social media.